The week of winter storms in January (18-22) here in Southern CA prompted me to replace my worn out hiking boots. Knowing that I would be hitting the trails over the weekend (sunshine in the forecast), I stopped at REI after work determined not to leave empty handed. I was scanning the women’s shoes when a clerk asked if I needed any assistance. I told him that I was looking for water resistant hiking boots. He asked if I was going to be doing light-hiking or if I was going to be backpacking. I told him light-hiking. 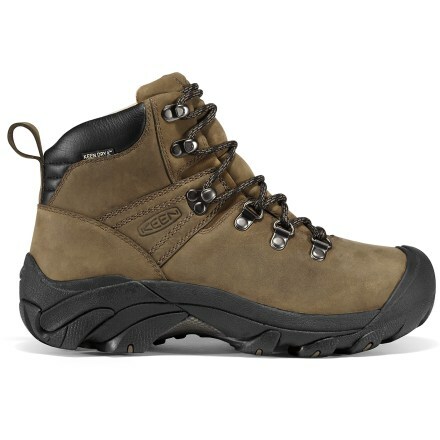 So he recommended light hiking boots with leather exteriors. He gave me a couple of brands and I tried each in a couple of different sizes. Finally, I settled on the Pyrenees Boot. I took them for a test hike on Saturday and Sunday, mostly on muddy trails going uphill. Sure enough, they proved to be light and sturdy at the same time. And the mud and water did not penetrate through the leather. Traction was excellent as well, as I felt my feet were firmly gripped to the ground. The only problem was that the right boot was too tight around my ankle. I wondered if my right ankle was thicker than my left one as I didn’t have a problem with the left boot. Other than that minor discomfort, the boots proved to be comfortable, light, water proof, and excellent on slippery muddy trails. I would highly recommend!